I was born in Glasgow in 1953 and raised and schooled in the satellite town of Paisley. I can recall playing guitar from around the age of 8 years. I Was sent for classical guitar lessons around the age of 12 for about a year and found my teacher singularly adept at discouraging musicality. I started deliberately making up songs and writing them down from about the age of 14 but I had been making up tunes on the guitar from as far back as I can remember. ï»¿ This is a shot taken in a bed-sit in Swiss Cottage shortly after I arrived in London. The guitar is (was) an Eko Ranger 12-string which I had brought down from Scotland and it was built like a tank. Structural integrity was never going to be an issue. And its octave 3rd string always lasted a good fifteen minutes, as I recall. I had not yet learned fingerstyle when I owned this guitar despite having taken classical lessons a few years earlier. No matter; fingerstyle on this guitar would not have been playing to its”¦er..strengths. To this day I don’t know what became of it. It may be propping up some bridge somewhere. It would certainly be up to the job. 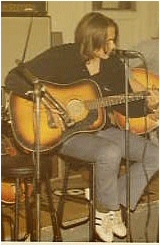 This was taken at the famous Troubadour Coffee House in west London. (There was a pub just next so that was alright.) I did several gigs in The Troubadour in the ’70s. The Troubadour is still going strong and I hope to revisit some time soon. 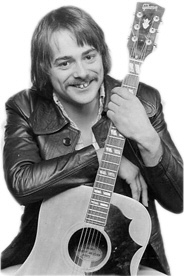 This is my first formal publicity shot taken in 1975 which was used as part of a promotional package to obtain engagements for a short tour of Belgium and Germany and despite which I got some bookings. The guitar was a Gibson “Country & Western” model which was my first “high-end” guitar. 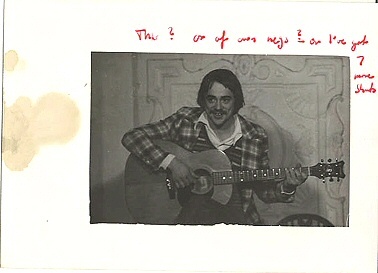 I think this is the earliest picture of me playing guitar in public, circa 1972. The guitar was a Framus on which I was taught fingerstyle by my friend who is on my left in this picture, just out of shot, and who I was sharing the stage with when this was taken. The music weekly “The Melody Maker” was the music paper for many years and carried a very respectable folk music section, albeit near the back of the journal just before the classified ads section. 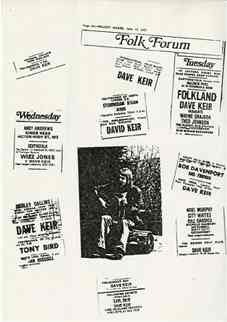 This is a collage of folk club listings that I was featuring in those days. This was, in its own small way, a very successful record and it became a usual occurrence to sell a number at gigs in the UK and abroad. It even got a second pressing. I don’t perform any of these songs or pieces now, although I have written a completely new lyric for “Bones” and plan to take it out. I want to re-record “Loose In The Rag And Bone” once more, and intend to rework “Disciples” into something new. The rest, though, belong to another time. 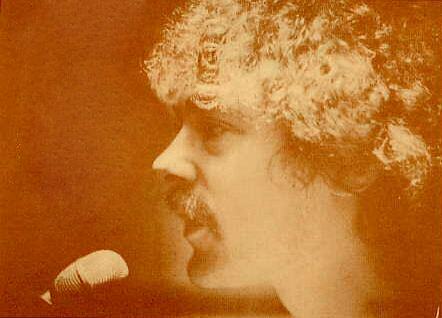 The 1970s are justly notorious for dodgy fashions and perms were only one example of this. It looks very strange ““ even embarrassingly silly ““ to my eyes now (and no doubt, yours), but it was, astonishingly, a very common “accessory” in these days. Shockingly, I think there were more photographs taken me sporting this than in any other guise, which is not something on which I like to dwell. It is only a grim determination to provide an accurate portrait of these days that enables me to post these pictures here. 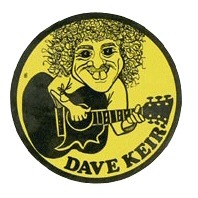 However, I’m afraid I would struggle to explain why even then I thought it would be a good idea to print 1,000 stickers with a bright yellow background caricaturing myself sporting this “style”. Anyway, it was to transpire that the nail in this particular promotional coffin was with respect to the glue used which made it impossible to detach the sticker without removing a some sliver of whatever it was adhered to. I was informed later that t here were some unfortunate souls who cheerfully slapped one of these yellow and black horrors onto their cars only to be faced later with expensive repairs to paintwork. Leaving it on a car wasn’t really an option either since the things weren’t weatherproofed and deteriorated rapidly with the first onset of rain. If it didn’t rain, then the sun bleached away the colour. All in all, it was a sad episode and neatly illustrates my incompetence in the sphere of marketing and promotion. When I look at it now, that wide-eyed toothy grin has a slight malevolent aspect that would give me uneasy dreams were I of a more nervous disposition. Oh, well. 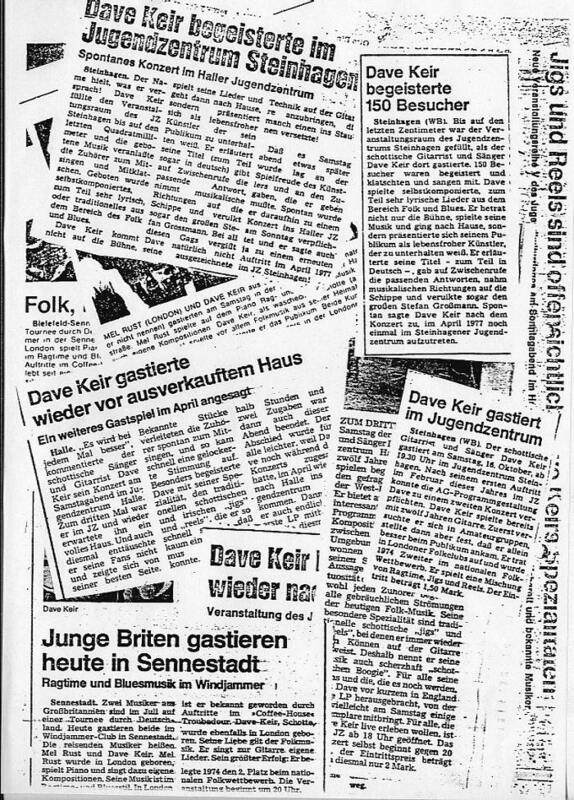 Above is a collage of newspaper cuttings of reviews during a tour of Germany. This was going to form part of a later press-kit which, in the end, didn’t see the light of day. Reading these now reminds me of great times and friendships which I remember with fondness. Putting it up on this page is an acknowledgment of all that. This is an extract from a sepia toned promotional flyer that flew around at one time. And there’s that perm again. I’m playing that Gibson “Country & Western” guitar which I used exclusively during my pro days in the ’70s and early ’80s. 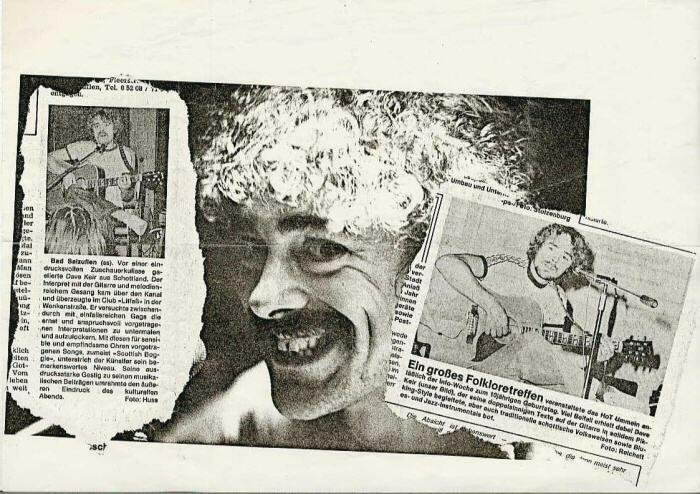 Below is another collage of German newspaper reviews which were originally intended for publicity material, but never used. More sepia toned flyer stuff. There was some hippy text that I’ve cunningly removed just leaving the hippy mug shot. A few of rest of the songs have contributions from some very excellent musician friends from the time, collectively members of “The Mighty Honky Band” (as was), and the remaining are just me. Again, only a couple, or so, of these songs have any currency for me today. Nevertheless, I have been playing around with GP, Last Night, Let Me Make It Tonight, and I Can See Dover, particularly, and plan to re-record them when time permits. Time will tell if they will again see the light of day on record or in performance. 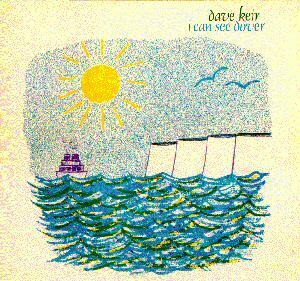 This record was made on the cusp of my decision, although obviously not yet made when the record was pressed, to retire from recording and performing. As a consequence, though, the record was hardly promoted and I didn’t take it on tour to Europe. For some reason I felt compelled to carry around boxes of these unsold records for more than ten years before I finally committed the whole lot (except one or two for sentimental value) to a recycling station in Aberdeen. I retired from recording and performing in ’82 for family reasons and, tiring of life in the big city, moved back to Scotland ’92. 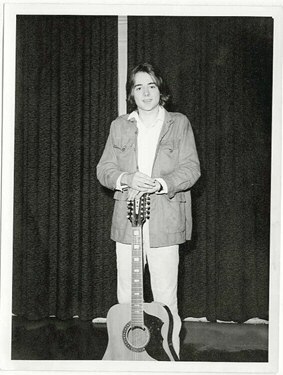 I had continued to play guitar and write during these years and, enabled by new technology and its affordability, I eventually set up a studio in the family house and started to set down the songs that had been accruing as well as developing my engineering skills by recording local musicians. In 2004 I started the project which would result in the 2006 CD “Interim Reports” and in 2005 I went online with the first version of this web site. Sometime around the time of setting up the studio, I got back into playing in local folk clubs and thinking about getting back on the road. I am now making arrangements for a tour of Scotland in the Spring of ’08 and working towards the release of a new CD in the Summer. Tours of England and Europe are now being planned for late’08 and ’09, respectively. My musical influences are varied and have changed over time. They start from the first song I ever remember hearing (The Cascades “The Rhythm Of The Rain”) and my father’s records of symphonies and my mothers opera recordings. My brother may be the biggest influence of all because he taught me my first chords on the guitar. His collection of Buddy Holly, Johnny Cash, Roy Orbison, and Marty Wilde records, among many others also made a lasting impression. The Beatles and Bob Dylan were the first artists whose songs I first learned to play and then emulated when making up my own first efforts. A friend I met in London taught me fingerstyle, so he may be the second biggest influence on my playing. He also introduced me to the songs of Loudon Wainwright III. 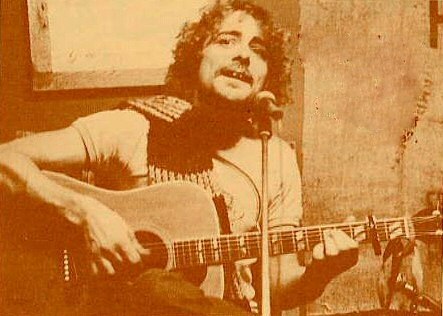 Stefan Grossman (and the blues guitarists whose playing he transcribed) and John Renbourn were the first players whose technique I studied and were huge stylistic influences. Jazz guitarists and some of the books they wrote awoke my interest in blues and swing techniques and more advanced chords, their voicings, and scales. Classical & romantic composers, particularly Mahler & Sibelius have later shaped some of my sensibilities and interests in form and Schopenhour’s books has caused my fascination with harmony. I continue to read about and study form and harmony and compositional methods. I think I would do this out of pure curiosity even if I were not to play another note. i send copies but get no answer so we never met . but im still listenin to shirts and bones ,my favorite song. swo i wiped my eyes and put on yorr site and read your wish to vote for songs .ivoted shirts and bones two times. My name is Lauren, and I am a product manager looking to develop some new products for gigging solo musicians. Do you have 20 minutes to speak with me about how you play and the issues you come across as a gigging guitarist? My schedule is fairly flexible, so I should be able to accommodate whatever day/time works best for you. FYI: This is a market research project and therefore not a paying gig; but you will have my undying gratitude! By all means. Please register here with your email and I’ll send you a private message to arrange. I saw you in Tielt in Belgium in 1976 in ” De Harlekijn”. I wrote a week later a review of your amazing performance. 40 years later some guy found my comment on your performance. I wrote that you had a cold and promised to come back. They found also two letters of you from 1977 where you wrote you liked to come back to Tielt. But your manager could not find a free day on your tour. What I still after all these years can remember is version of You can leave your head on ( Randy Newman). If you want I can mail you the copies of your letters and my comment. I hope you are still in good shape in Scotland. I’m sorry it has taken me so long to reply to your kind note. You know, although it was so long ago I do remember De Harlekijn! Did I play there only one time? I remember I used to take photographs of all the venues that I played and I when I read your comment I went looking to see if I could find any of De Harlekijn. No luck yet but I will keep looking. I also remember I had promised to come back but in 1981 (?) my personal circumstances prevented it and I never got to play in Belgium again. It remains on of my biggest regrets. I still have hopes to return one day… just a dream? Well, maybe. I’m sorry to hear that Jackie is unwell. I remember her name, although I’m sorry my memory for faces is not so good. If she remembers me please pass on my best wishes if you are in touch with her. I am in very good shape, thank you for asking, and I still play in Edinburgh and I am still writing music. I would be delighted if you could send me a copy of letters and comments. If you could .pdf them then that would be a huge favour to me. 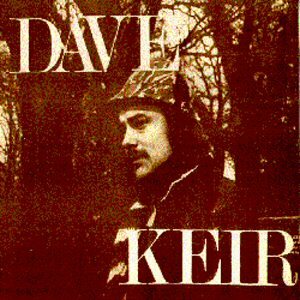 Anyway, you can always write to me at dave.keir1@gmail.com – I would be delighted to hear from you! I’m Duke Addleman – a fan and independent filmmaker from California. I would surely love to use “Red John” in my current film “Breathe Breana”. In short, “Breathe Breana” is a film about a girl with cystic fibrosis who is gunning for the world championship in tandem surfing (a beautiful mix of pairs figure skating and surfing). In short, I have a music budget (limited) and think that your song is the perfect introduction/transition from the stoic, lone surfer to the ebullient tandem surfing world. I would love to share the clip with you as well as discuss where this small but mighty film is likely to show. Thank you for getting in touch – of course I would be delighted for you to use Red John and I’ve sent you a fuller reply to your email.